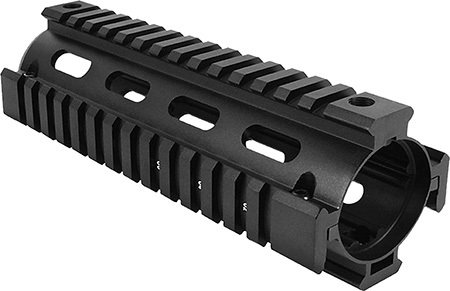 This M4 carbinelength dropin quad rail by Aim Sports is an easy to install upgrade for the basic carbine. Made from aircraftgrade aluminum it is compatible with most carbinelength direct impingement gas systems. The twopiece design requires no gunsmithing to install and is compatible with all standard WeaverPicatinny 1913 accessories. It is 6.5 long and weighs 11.03 oz.This model has a black anodized finish."